Flow cytometric analysis of live mouse splenocytes using CD4 (RM4-5) Rat mAb (APC-Cy7® Conjugate) (solid line) compared to concentration-matched Rat Isotype Control (APC-Cy7® Conjugate) (dashed line). For optimal flow cytometry results, we recommend 0.25 μg of antibody per test. Supplied in 10 mM NaH2PO4, 150 mM NaCl, 0.09% NaN3, 0.1% gelatin, pH 7.2. This product is stable for 6 months when stored at 4ºC. Do not aliquot the antibody. Protect from light. Do not freeze. 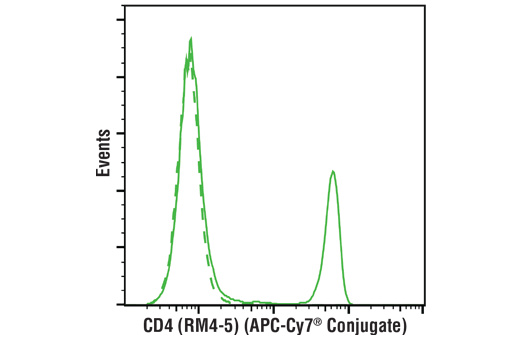 CD4 (RM4-5) Rat mAb (APC-Cy7® Conjugate) recognizes endogenous levels of total CD4 protein. This antibody detects an epitope within the extracellular domain. This Cell Signaling Technology antibody is conjugated to APC-Cy7® and tested in-house for direct flow cytometric analysis in mouse cells. Cluster of Differentiation 4 (CD4) is a glycoprotein composed of an amino-terminal extracellular domain (four domains: D1-D4 with Ig-like structures), a transmembrane part and a short cytoplasmic tail. CD4 is expressed on the surface of T helper cells, regulatory T cells, monocytes, macrophages and dendritic cells, and plays an important role in the development and activation of T cells. On T cells, CD4 is the co-receptor for the T cell receptor (TCR), and these two distinct structures recognize the Antigen–Major Histocompatibility Complex (MHC). Specifically, the D1 domain of CD4 interacts with the β2-domain of the MHC class II molecule. CD4 ensures specificity of the TCR–antigen interaction, prolongs the contact between the T cell and the antigen presenting cell and recruits the tyrosine kinase Lck, which is essential for T cell activation (1). Zamoyska, R. (1994) Immunity 1, 243-6.